We are into the business of offering Navahridaya Kalpa Tablets which asre widley reckoned as miracle drug. Navahridaya Kalpa is a meticulously researched combination of Sarpagandha, Arjuna, Ashwaganda and other herbs. These herbs are carefully selected for their excellent properties of cleansing and nourishing the circulatory system, strengthening the heart and helping eliminate stress. 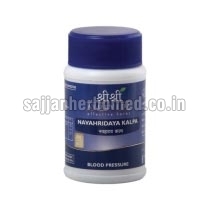 Navahridaya Kalpa Tablets have proven to be excellent in combating blood pressure and cholesterol. They take good care of heart by maintain cholesterol levels in the body. Ingredients : Red Lotus, Ashwagandha, Bilva, Arjuna, Durva, Maricha, Punarnava, Ashwath, Pippali, Sarpagandha, Shunti, Nimba, Tulasi, Rasna, Vishukranti, Yashtimadhu. Indications : It is used to treat Hypertension and Heart Diseases. Dosage : Two tablets to be taken thrice daily with lukewarm water.